After reading the “Important Replies from Holy Virtuous Ones and Eminent Monastics” dated on the sixth day of the first month of the lunar calendar, I was very much astounded. I really hate myself for being so stupid and ignorant. I did not even analyze the matters that are clearly in the open and had to wait until the great holy virtuous ones to mention them to wake up from the deluded dream state. We are truly so pitiful and must slap ourselves two times to wake up! Since H.H. Dorje Chang Buddha III is such a great Buddha, why would there be disciples who betrayed Him? This obstruction of confusion always locked me and constrained me tightly so that I was unable to untie the doubt. In particular, some of them are famous masters who followed H.H. Dorje Chang Buddha III for so many years. How could they still betray the Buddha? I could not figure this out! I could not figure this out! After reading the answer dated on the sixth day of the first month, the doubt has finally been removed to see the blue sky. I am truly too stupid, too stupid! I should slap myself two times again. Why couldn’t I see through such clear matters! I had to rely on the great holy virtuous ones to point them out to see the truth. Thinking back now and making comparisons, it is certainly true that evil and defrauding masters are deeply in hiding. However, their purpose is to defraud Buddhists to gather offerings to make a living for themselves. Restrictions on them set by true Buddha-dharma and the precepts that require them to benefit living beings are opposite to their purpose. To escape from the restrictions, they, of course, must betray true Buddha-dharma. The situation is so logical. But, why couldn’t I think this through without being pointed out by holy virtuous ones? I should slap myself two more times! It is true that traitors emerged from disciples of H.H. Dorje Chang Buddha III. 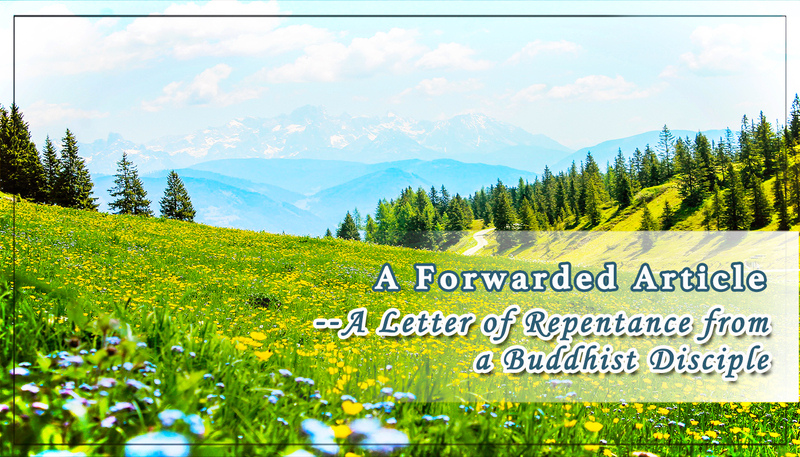 However, even more traitors emerged from disciples of Sakyamuni Buddha. This is because the Buddha’s teaching and dharma restricted their evil behavior, so they had to betray to escape by completely joining evil practices. Why didn’t I think about this fact at the time? I am too pitiful! I should slap myself two more times again! From detailed investigations, each and every one of the so-called famous master who betrayed is an amateur to the sutras, vinayas, and shastras (commentaries), without even one who understands the teachings of the sutras. They fake great holy ones but forcefully reach their hands out to commit fraud. Their words are full of evil statements showing ignorance to Buddhism. Why didn’t I think about this? Not even understanding the principles of true Buddha-dharma, can they be holy ones? Earning such poor scores from the examination, can they be holy ones? Making erroneous answers to questions on the fundamental principles of Buddhism, are they still Buddhists? Moreover, those who betrayed all have no knowledge of the sutras, vinayas, and shastras of Buddhism and all speak falsely in evil and harmful ways. Why didn’t I think this through? Only until the answers from great holy virtuous ones have been published, did I understand this fact today. I am truly as silly as a pig! Now I should slapmyself even three more times! I slap myself for being so silly and not thinking about such simple truth. I only thought about that some disciples of H.H. Dorje Chang Buddha III betrayed. Why didn’t I think about the fact that even more disciples of Sakyamuni Buddha had betrayed? Why didn’t I think about the fact that these masters who betrayed have no knowledge in sutras, vinayas, and shastras and always speak baselessly fabricated lies? We are simply pitiful! I now understand today! I will repent over and over again! !